Age: 56Dealer since: 1988Dealerships: Fairway Chevrolet and Fairway Pontiac-Buick-GMC, Las Vegas; Pahrump Valley Auto Plaza (Chevrolet-Pontiac-Buick-GMC), Pahrump, Nev.; Henderson Chevrolet, Henderson, Nev.Average monthly Chevrolet sales: 50 new, 80 usedQuote: "We're in survival mode here and trying to get into a new year and keep as many of us together as we can. I never thought I'd say that, but that's the case. We're selling 50 to 60 new Chevrolets a month, when we used to sell 200 to 240 a month." Chevrolet dealers have two new products coming — the redesigned Chevrolet Equinox and the long-awaited Camaro — and dealers hope those vehicles will hold the brand until General Motors can regain a financial foothold. With GM advertising dollars cut, new-car sales plunging and the credit market dried up, Chevrolet dealers worry about losing their businesses. Greg Heinrich, the Chevrolet representative on the General Motors National Dealer Council, spoke with Staff Reporter Jamie LaReau. 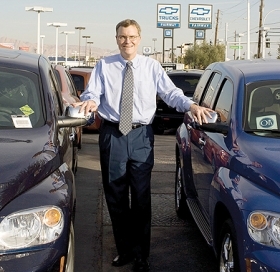 What will 2009 be like for Chevrolet dealers? Chevrolet will have to work on doing more with less. I expect the marketing budget will be less and the incentive budget will be less. And we know people's perceptions of our products are challenged. People are not eagerly shopping Chevrolet showrooms, so how are we going to get people who are in the market to change their perceptions? I'm concerned; how, with less, are we going to be able to appeal to the consumer? We'll have the new Equinox and Camaro, so we'll have products in the short term. In the next 12 to 18 months, we'll be OK; it's how to get customers to shop us and feel OK about a Chevrolet product. What are the dealer council's top concerns? How is the factory responding to those concerns? The communication is better than it has ever been. Senior management and GM, realizing the times we're in, have really reached out to the dealer body even better than they did before. It'd be really easy for them to hunker in the bunker. Obviously, dealer profitability and keeping the dealers in business are my top priority. I know GM's plan stated that they'd reduce dealer count by maybe 1,700, but as a council chair I'd like to keep our dealer body intact. Is Chevrolet's advertising attracting your target buyer? I think it's doing a good job of that. I'd say I might be a bit critical of the Red Tag advertising. I don't think it's retail enough. I think it's a little soft, given the market we're in. I've stated that to Chevrolet on several occasions. They don't agree. But advertising is something that if you get three people in the room, they don't all agree. The Malibu advertising on that launch has been outstanding. The advertising for the Traverse has been good, but the response to it was weak for a launch. Are Chevy dealers profitable? Do you expect them to be profitable in 2009? I'd say around 60 percent to 64 percent of them were profitable for 2008. Profitable could mean they made $1 for the year. I don't see information that is very detailed. So they could be profitable but not making the kind of return they need to. What could happen in 2009? I think that number could decrease a few percentage points and you'd have some dealerships close, so that could change the percentage. But it's not a rosy picture anyway. GM is going to shed some nameplates over the next few years. Which nameplates could Chevrolet afford to lose? The TrailBlazer is scheduled to go, so that's one that I could see. In the Chevrolet lineup, I'm just thinking we need to offer those trucks. Cars? I don't see any cars I'd like to see us give up. But, hey, we may have to give up a few. We could end up with Saturns in with Chevrolets, so it's hard to tell. Would you want Saturn products blended with Chevy? I actually think their product lineup is pretty strong. I'm willing to work with them any way I can. Right now I'm very concerned for the Saturn retailers. The Pontiac strategy makes sense, one to two models. But the Saturn deal is like a punch in the stomach. These are good retailers and good car people. I'm concerned on how this all sorts out. What's missing in Chevrolet's lineup? When we get the Camaro convertible, we'll be covered. The Camaro coupe is coming in 2009 as a 2010 model so I think the convertible has been pushed back a year or two. I hope that program doesn't get dropped, because I think a little convertible would be nice. I think the Chevrolet lineup is pretty good. I don't think we have any holes. With GM's financials woes, is there still a business case for the Volt? Absolutely. We very much look forward to that car. We know gas prices will go back up eventually; that car is on the order of make it or break it. That car will prove to the skeptical consumer that GM can build quality cars. We've got to get some type of tax credit on that car. That's another thing as we move into 2009; we need to get some sort of tax credit to encourage people to purchase new Big 3 vehicles. There are 1,200 Toyota dealers and 3,800 Chevrolet dealers, and it seems out of whack. I'm talking out of both sides of my mouth here because I don't want to see people lose their family businesses, but on the other hand there are areas where we're overdealered. What are Chevy dealers doing to attract more service business? They are actively marketing to their customer base and sending fliers, e-mails, phone calls and postcards with specials to encourage customers to come in. There is a pilot program we're involved in — when a customer purchases a new vehicle, there is a conference they go through about our service, and then we schedule a pit stop for them to come in and make sure every thing is tight, tires are good, no water leaks and everything is running right, and then we schedule the first service appointment at that point. We're into our third month of doing it; it's good because what it does is gets the customer from sales and then tied to the service department. Dealers are getting pretty creative on ways to attract customers. Are dealers not making profits from new cars? That's correct. I don't know anybody who's making a profit in their new-vehicle department. We've had 41/2 months of factory programs where the price was set, so it's very tough that way. How is the new Traverse crossover doing? The reaction is good, but financing is the challenge. It's a $30,000 vehicle. The ones we've sold have been in the lower-$30,000 range, not the high end. People are price-conscious right now. The sales have been a lot less than we expected, but that goes with the times. I think a lease would be great; it would help a bunch. I'm concerned that the Traverse has had a rough launch, and it has sort of gone under the radar. First impressions make a difference. How can Chevrolet dealers reduce floorplan costs? That's really tough when we're getting a lot of encouragement to take more vehicles in order to get incentives. It's a very difficult line to walk to balance your inventory; you've got to try to control it and limit it as much as you can, but you also try to help your manufacturer out. A few years ago, Chevrolet leader Ed Peper was pushing for facility upgrades. Where does that stand — and in this environment is it even reasonable to suggest it? We need to continue to work on that, but Chevrolet has backed off because of the environment that we're in. It's fair for our manufacturer to expect our facilities to be fresh and current, but not in a time when we're fighting for our survival. What are your goals for Chevrolet dealers? I want to keep the Chevrolet dealer body intact and profitable. I want to work with Chevrolet to make sure that happens, to make dealers profitable not only in their store but in their service department. We're in survival mode here and trying to get into a new year and keep as many of us together as we can. I never thought I'd say that, but that's the case.